UCF returned from its unexpected week off on Friday night and beat FAU 56-36 at Spectrum Stadium. 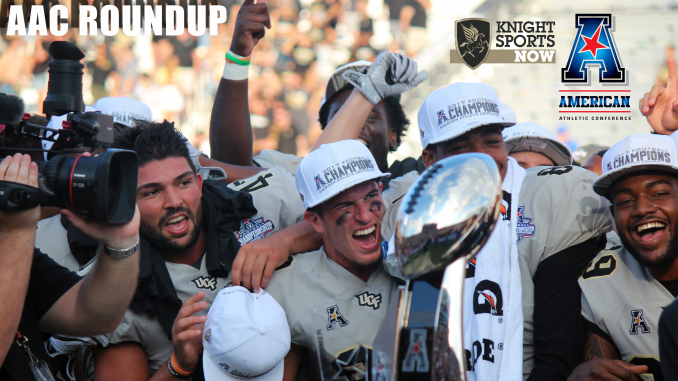 The Knights (3-0, 1-0 AAC) are now No. 13 in the AP Poll and will be right back at it on Saturday against Pittsburgh. Before we get there, let’s take a look at what else went on in the AAC during week four. The AAC continued to be unpredictable this weekend, with some closer-than-expected games and an upset. The SMU win over Navy shook things up a bit in the AAC West, but it was also a surprise to see South Florida tested by East Carolina and Cincinnati need a big comeback to beat Ohio. The AAC East still runs through UCF, with the Bulls and Bearcats having outside shots to unseat the defending champions. The AAC West is likely a two-team race between Houston and Memphis, with Navy suffering a tough setback this weekend. SMU now sits at the top of the division, but time will tell if the Mustangs are true contenders. The Cougars and Tigers, despite having one loss each, just appear to be on a different level than the rest of the division. If the Knights find themselves in the conference title game, they’ll likely get a tough challenge from a ranked team.